Americans are not the only ones seeing their weight creep up on the scale -- obesity rates continue to rise across Europe as well. Europeans are now second only to Americans in the number of people who are overweight or obese. The World Health Organization cites obesity as one of the most prevalent health concerns of this century. If you carry too many extra pounds, you’re at risk for a host of physical and psychological problems. Obesity also contributes to rising health-care costs in America and Europe. As societies and governments work to ease the obesity epidemic, you can help yourself by eating nutritious foods and finding time to exercise on a regular basis. If your weight is more than what's considered healthy for a person of your height, you’ll be labeled as either overweight or obese. Body Mass Index is one of the simplest and most widely used tools to screen for obesity. BMI divides your weight in kilograms by your height in meters squared. If your BMI is less than 18.5, you are deemed underweight. Individuals with a BMI between 18.5 and 24.9 are considered healthy. Overweight is described as a BMI between 25 and 29.9, and anything over 30 is categorized as obese. To find out your own BMI, you can use an online calculator. There are limitations to using BMI to assess your body fat though. While BMI measures extra weight, but it can't determine if that extra weight is from fat, muscle or bone mass. It also doesn't take into account age, gender or race, which can all influence your BMI. There are other methods available that directly measure body fat, including skinfold thickness measurements, bioelectrical impedance, underwater weighing and dual-energy X-ray absorptiometry. One-third of Americans -- or 78.6 million -- are classified as obese according to a paper published in 2014 in The Journal of the American Medical Association. Obesity rates vary by age and ethnic group. 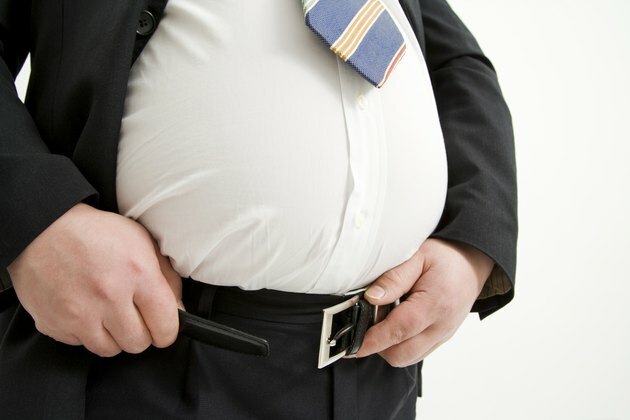 Middle-aged Americans, 40- to 59-year-olds, have the highest obesity rates. Regarding race, non-Hispanic blacks have the highest obesity rates, followed by Hispanics, then non-Hispanic whites and finally non-Hispanic Asians. Seventeen percent of children in the United States are obese. On a brighter note, obesity rates in preschoolers dropped from 14 percent in 2003 to 2004 to 8 percent in 2011 to 2012. Obesity affects the entire country, with no state able to claim an obesity rate below 20 percent. Washington, D.C., California, Colorado, Vermont, Massachusetts and Hawaii have obesity rates between 20 and 25 percent. Arkansas, Mississippi, and West Virginia all have obesity rates higher than 35 percent. When you break down the problem geographically, Midwesterners have the greatest prevalence of obese adults, followed by the South, then the Northeast and finally the West. Over the past several decades, Europeans have been watching their waistlines grow, but not as rapidly as the United States. The average rate of obesity across Europe is one in six adults, or 17 percent of the population. Europe is a melting pot of different cultures and economic levels, which accounts for a lot of disparity in Europeans' obesity rates. For example, at 8 percent, Romania has one of the lowest rates of obesity in Europe, while the United Kingdom and Hungary have obesity rates that top 25 percent. Other countries with relatively high obesity rates include Turkey, Andorra, Czech Republic and Malta. Obesity rates among men and women are relatively stable, with a few exceptions. Men in Slovenia, Luxembourg and Malta are much larger than women. Women in Latvia, Hungary and Turkey have higher rates of obesity than their male counterparts. Obesity contributes to heart disease, stroke, diabetes, high blood pressure and cholesterol, asthma, sleep apnea, gallstones, kidney stones, infertility and certain cancers. Obese individuals might also experience discrimination, relatively low wages, poor quality of life and high rates of depression. Not only does your health take a hit, but so does your wallet. Annual medical costs for obese individuals are over $1,400 more than for those of healthy weight. There is no better time than now to get your weight under control. You can successfully manage your weight by choosing a variety of healthy foods and drinks, and exercising regularly. Choose whole grains over refined grains; eat plenty of fruits and vegetables; choose lean protein sources. Opt for healthy fats found in nuts and fatty fish over unhealthy fats in processed meats and many prepackaged desserts and snack foods. Reduce your intake of high-sugar foods such as desserts, candy and sweetened drinks. Gradually incorporate more and more physical activity into your day, and cut back on your screen time and how much you sit throughout the day. Finally, get enough sleep every night. Sleep deprivation increases your risk for obesity, according to a review published in 2008 in Obesity. Lack of sleep may make you too tired to exercise and may also disturb the hormones that regulate your appetite, causing you to overeat.